The HR module lets you input all employee related details including company details, personal details, salary details etc. You can also scan employee documents like PAN card, driving license, Aadhar card and other such details. Moreover, neither the management nor the employee has to remember the date of expiry of any of the above documents, ORECS keeps on reminding about the expiry and renewal of any of them to both management as well as employee in advance to arrange for procedure of renewal with the concerned. There is also provision for inputting employee achievements, track employee progression in the system and also allow the company to black list employees in case of mis-conduct. This will be of utmost importance at the time of employee performance evaluation, especially when the Manpower is spread in multiple location sites. This is one of the Compulsory Modules, as every User of Software (login) has to be an Employee in HR Module. Daily attendance sheet is the key feature of ORECS – HR Module which allows the Management to get the information about daily attendance of manpower with the facility of sorting as per Site, Project, Month and Date, which makes its compatible for Dynamic Analysis. Being online, ORECS – HR Module helps the Management to get the day to day reports of remote sites located in diverse geographical locations, all at same time without the compulsion to call HR Manager or Site Supervisor. Once the salary is updated in system, the Management can calculate the salary on daily basis as per the attendance as per site and project to get the judgement about expense of specific site or project and hence the profitability of that specific site or project in real time. Division, Department and Designation can make a perfect matrix for assigning Salary to an employee, in addition to the ability of tracking the performance index which helps as a perfect evidence for appraisal of employee based on individual output. ORECS has the ability to track each and every expense of every employee, no matter how much is the amount, which makes it possible for Management to scrutinize the money spend by employees while they are working for the company. Moreover, ORECS can fetch the data in fraction of seconds, no matter how much old it is, which reduces the storage of bills and supporting documents of all the expenses incurred by the employees. Android Application of ORECS has an added facility of capturing image of the invoice or bill, against which the expense was incurred, and hence it keeps accurate books of accounts without the need of storing hard copy of every documents and scanning it. 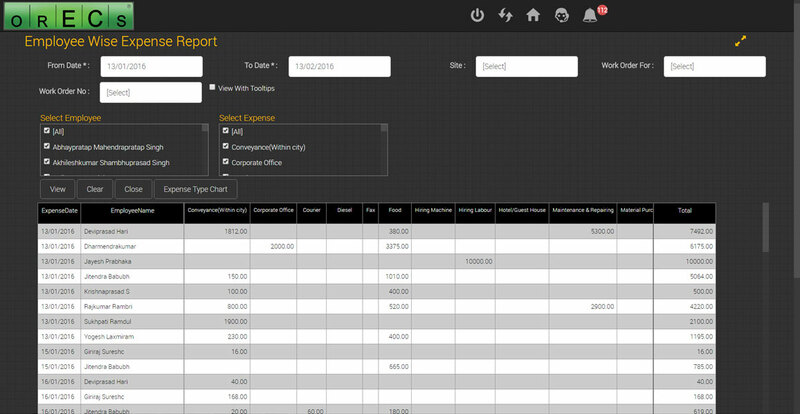 Screenshot : Below screenshot shows the Employee wise Expense Report from 13/01/2016 to 13/02/2016 for all Employees and all types of Expense Heads. 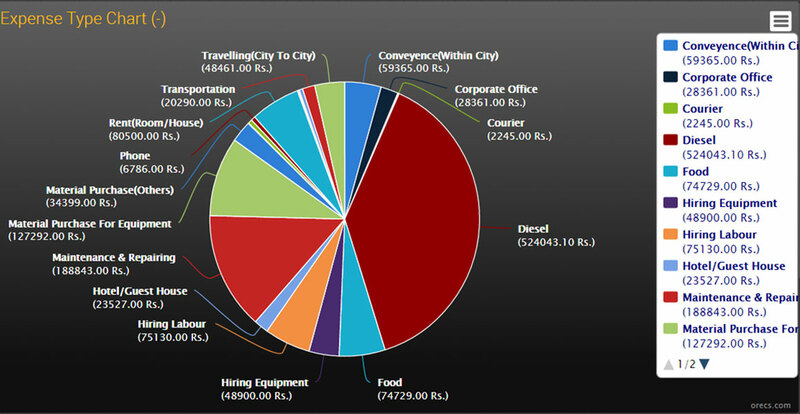 The second screenshot shows the Pie Chart of Expense Heads for the same period. 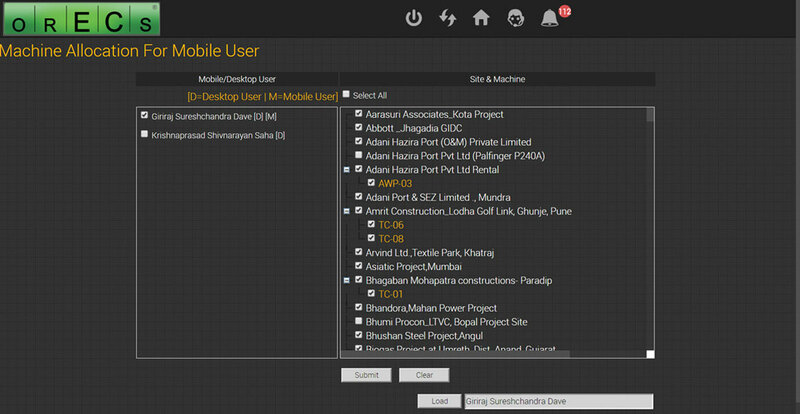 When a new employee is registered in ORECS, it has to be assigned to specific site and even machine (optional), which gives a virtual connection of employee and site (and machine), and hence total expense and profitability of any particular site (and machine) can be easily worked out based on salary, site expense and responsible employee. Various Alerts triggered from system using SMS and Email will also go to the specific Employee who is connected with a specific Site and Machine. Connection to the Machine is an optional feature. 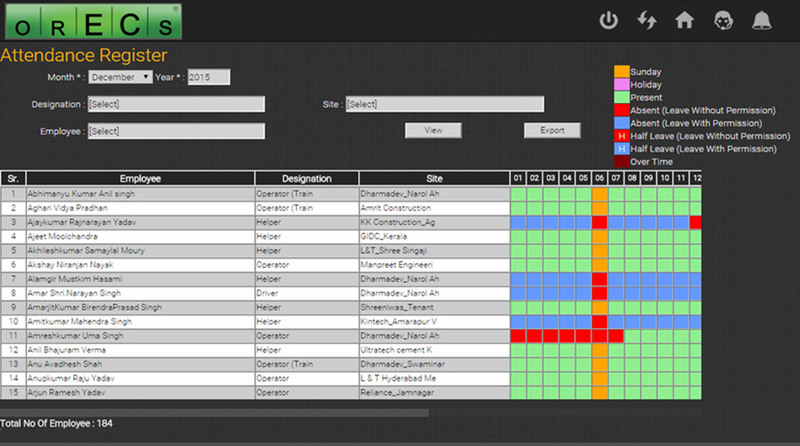 Screenshot : Beside screenshot shows the connection of Employee with a specific Site and Machine. Every employee has a different role in the company along with diverse responsibilities, when it is a matter of dual responsibility and task allocation, ORECS plays a vital role. Each employee can have unique Rights for accessing data from ORECS, and hence it keeps a tight control over information flow within company and helps the management in avoiding disclosure of confidential information. 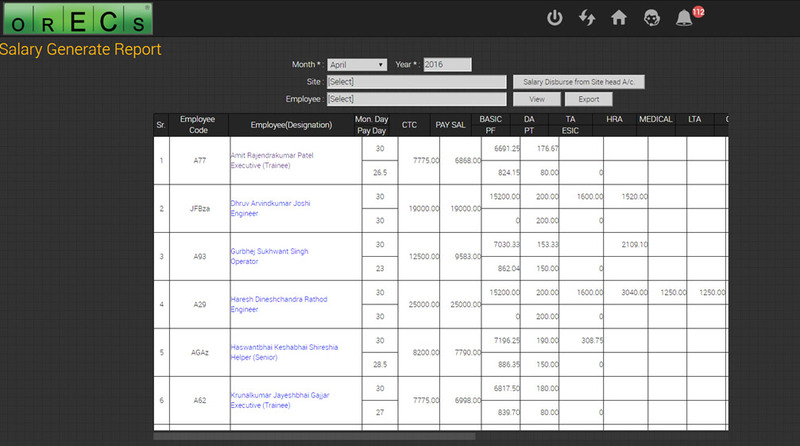 Screenshot : Beside screenshot show how the Access to Data is controlled from Menu for a specific Group of Employees using Rights Allocation System.